When the Boeing 777 entered service in 1995, it dramatically advanced the state of the art by being the first airplane ever to be 100 percent digitally designed in three dimensions using computers. Boeing subsequently applied this pioneering capability to the design of its X-32 Joint Strike Fighter and the F/A-18E/F Super Hornet strike fighter. As this 777 example shows, world-leading technical excellence is distributed equally throughout the company's engineering ranks, and technologies developed by or initially used on Boeing's commercial side can also benefit the company's military customers. The company's commitment to this process of lifelong learning in its programs enhances value for the customer and increases the efficiency of Boeing operations. Commercial-to-military technology flows are common in the global aerospace industry, and they have characterized The Boeing Company since the propeller era (see sidebar on Page 39). These beneficial transfers of expertise attest to the strong Boeing focus on delivering greater value to customers by leveraging world-leading company expertise and applying it more broadly across the enterprise. Integrated Defense Systems workers in St. Louis today find it easier to build F-15E strike fighters thanks to Flex Track, an innovative manufacturing technology developed by Commercial Airplanes. Since last May, this automated drilling system has saved the company time and money by simplifying the production of F-15 center and aft fuselage sections. Portable and low-cost, Flex Track is a programmable, numerically controlled tool that creates and countersinks fastener holes in a single pass. It takes its name from the flexible rails that it rides over the component it is drilling. Assembled from interlocking track segments, these rails are secured to the component via suction cups. Boeing workers do not have to place them exactly, because Flex Track—which is small and light enough for one person to lift—knows precisely where it is in relation to the part. This versatile tool can work on highly contoured airframes. It has built-in visual and vacuum systems that let it orient itself, follow cues, and clean up its own shavings. As it glides over the part being drilled, its computer program—also developed by Boeing—analyzes what the tool "sees" to locate and drill holes within a couple of thousandths of an inch of the desired location. That's well within tolerance. Flex Track is the brainchild of engineers in BCA Manufacturing and Process Technology. First deployed by IDS on the F-15, this commercial technology will soon be used on the F/A-22 and C-17 programs as well. In the near future, Flex Track will soon also be deployed to the 787 Dreamliner program to help assemble this commercial airplane's wing panels and join its fuselage sections. The F/A-18 Super Hornet strike fighter program similarly benefits from a BCA-developed manufacturing technology. 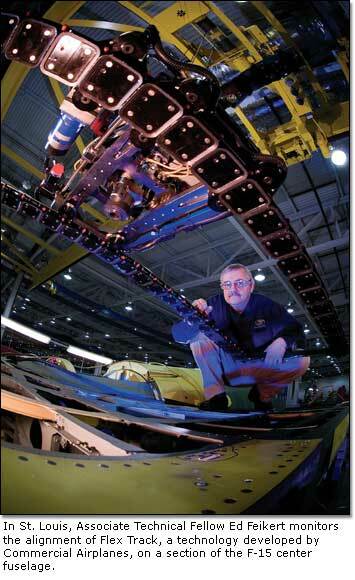 The Numerically Controlled Drill Jig (NCDJ) was created during the 767 program to fasten that airplane's wing spars. Boeing subsequently transferred NCDJ technology to IDS for the production of Boeing F/A-18 forward fuselages. Today, the same NCDJ robot also helps fasten the Super Hornet's outer wing skins. Boeing Phantom Works, which is charged with propagating "best technologies" throughout the Boeing enterprise, was instrumental in moving NCDJ and Flex Track beyond BCA, where they came into being. The fact that Flex Track was first deployed on the military side of Boeing attests to the effectiveness of this focus on leveraging the company's technical excellence. 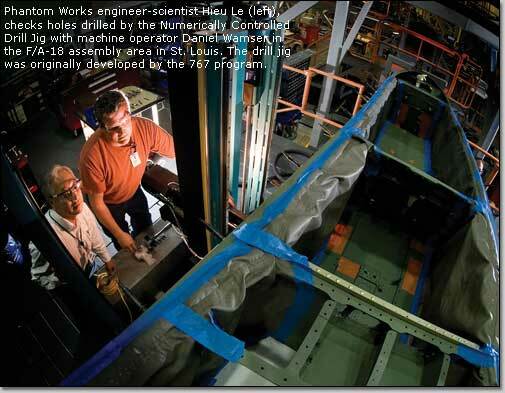 A key 787 Dreamliner innovation is one-piece barrel construction, a BCA engineering and manufacturing breakthrough that creates entire sections of the 787's largely composite fuselage as a single structure (see Page 12 of the March 2005 Boeing Frontiers). Discussions are now in progress that may see this remarkable commercial technology applied to a Boeing military helicopter program. Many other manufacturing technologies pioneered by engineers on Boeing's commercial side today also benefit the company's military programs. Among these are two environmentally preferred aircraft coatings—boric sulfuric acid anodize for paint adhesion and phosphoric acid anodize for adhesive bonding—developed by BCA to eliminate the environmental consequences of primers previously used by the aviation industry. These more benign coatings are today widely used across the company. Another example is controlled atmospheric pressure resin infusion (CAPRI), a new Boeing-funded composites manufacturing technology. Developed by BCA engineers with support from Affordable Structures & Manufacturing Technology (AS&MT), a Phantom Works thrust organization, CAPRI is a BCA resin-infusion technology that will soon be used to create wing trailing edges and other components for the 787. In the meantime, Boeing has deployed CAPRI to IDS, where it is used to manufacture landing gear doors for the C-17 Globemaster III transports that Boeing delivers to the U.S. Air Force. Challenges often arise when leading technologies are called on to address new and different requirements. Resolving these challenges adds to the company's expertise and improves its technological prowess—an ongoing process that benefits Boeing commercial and military customers alike. For example, BCA began experimenting in the 1970s with composite tape-laying machines—a technology then in its infancy—with the goal of producing flat composite skins for the 737's control surfaces. In the 1980s, Boeing transferred this evolving capability to the military Northrop/Boeing B-2 bomber program, where further progress was made in composites manufacture. The result was the contoured tape lamination machine (CTLM), a technology that returned to BCA at the start of the 1990s to help create the 777's composite empennage. The challenges of the 777 program lifted this manufacturing technology to new heights, significantly improving the state of the art. As a result, CTLM went on to provide the Lockheed/Boeing F/A-22 Raptor jet fighter with composite wings. CTLM technology will next be applied to the 787 Dreamliner, whose airframe is 50 percent composites by weight. Engineering challenges associated with this commercial program will once again greatly advance CTLM technology. Airlines and their passengers will benefit, as will military customers in subsequent applications of this matured Boeing manufacturing capability. Advancements embraced by airplane designers—such as fly-by-wire flight controls or full-authority digital engine controls—sometimes begin life on the military side of the fence and are subsequently applied to commercial airplanes. Less well-understood is how commercial technologies have benefited the design of military aviation. DC-10 and MD-11 jetliner. Despite its additional windows and modified shape to meet military requirements, the C-17 forward fuselage has a great deal in common with those commercial jets. Much of the internal structure is identical, for example, and the forward flight-deck windows use the same glass panes as the MD-11. The C-17 also sports winglets, a technology first applied by today's Boeing—on the 747-400 and MD-11 jetliners. Like all Boeing military jets, the C-17 also benefits from composite brakes, radial tires, and flight-deck warning systems, such as windshear and collision avoidance, that Boeing first used aboard its commercial airplanes. BCA advancements will continue to benefit military customers in the coming years. For example, the recently unveiled 787 flight deck employs liquid-crystal instrument displays that are much larger and much less costly than the displays of current-generation transports because they are commercially available units. While Boeing does not see an immediate military application for this latest liquid-crystal display technology, one will inevitably arise. When the 787 enters service, it will spearhead a profound reinvention of how Boeing delivers software to the jetliners in its world fleet. Known as Boeing Electronic Distribution of Software (BEDS), this network-centric technology will reduce costs for airlines, eliminate the use of obsolete transport media, and further enhance operational safety by ensuring software integrity and automating its configuration management. BEDS replaces a cumbersome and costly process that today relies on floppy disks, CDs, signed documents and shipping via bonded carriers. In their place, it employs advanced cryptographic techniques to perform electronic functions analogous to the packing, shipping and signing for physical software and documentation. BEDS is expected to meet and further enhance the intent of the existing FAA-approved process. Mathematics and Computing Technology (M&CT), Phantom Works, is building key BEDS components and is leading the introduction of this BCA technology to the company's military business units. Because of the obvious benefits of BEDS, the military services are already expressing interest in it for support of their Boeing fleets, so military application of this pioneering technology is probably not far off. As BCA engineers design the 787 Dreamliner, a remarkable Phantom Works technology called Intelligent Graphics (IG) dynamically generates and continuously updates this evolving airplane's wiring diagrams from a database. Static wiring diagrams that instantly become outdated will not complicate life for the 787 design team. Developed by M&CT, the Phantom Works organization that specializes in advanced information technology and optimized computational solutions, Intelligent Graphics made its debut in 1998 with BCA Commercial Aviation Services in the enormously successful portable maintenance aid, an interactive maintenance tool that allows mechanics and engineers to analyze and solve airplane problems right at the airline's work site. B-52, C-17, C-130, F-15, KC-135, and the Apache and Chinook helicopters. Its pending use on the 787 program will return a more capable version of this powerful Boeing information technology to BCA, where it was first deployed. Using Boeing Phantom Works and BCA funding, BCA and PW's Lean & Efficient thrust organization have collaboratively developed several pioneering technical methods and processes for enterprisewide use. One is a new external loads simulation tool called the Boeing Aeroelastic Process (BAP). BAP is a finite-element airplane-loads process technology that has debuted with the 787 Dreamliner and is now being applied to the P-8A Multi-mission Maritime Aircraft being developed for the U.S. Navy. Plans call for BAP to be used routinely on all Boeing commercial and military aircraft development programs. BCA and Phantom Works also led the development of Boeing Test Analysis Correlation Solutions (BTACS), an interactive tool that combines mathematical processes and user interfaces to facilitate the correlation of test and analysis data. Like BAP, BTACS has been developed for use across the Boeing enterprise. First used on a 767 wind tunnel flutter model and then the 787 program, it has been further deployed this year to the F-15, C-17, and the International Space Station. In addition to providing airline passengers with in-flight broadband Internet connectivity, Connexion by Boeing also flies aboard Boeing C-40Bs, U.S. Air Force versions of the Next Generation 737, and Boeing C-32s, which are 757s operated by the Air Force for VIP transport. Connexion by Boeing is the backbone of airplane e-enablement, an emerging cost-saving technology that the 787 Dreamliner program is pioneering. This capability turns airplanes into active high-speed nodes on the Internet. It is of growing importance to civil and military customers alike. The Boeing commercial-to-military technology transfers highlight an ongoing trend that provides greater value to Boeing customers. 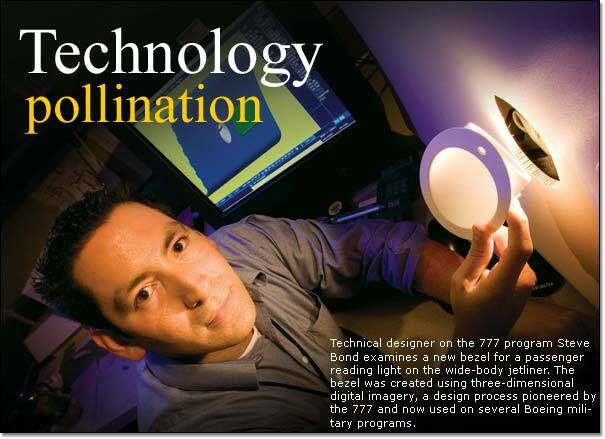 They also illustrate the intelligence, energy, and commitment to excellence and lifelong learning that together characterize the engineering ranks of The Boeing Company. At Boeing, commercial-to-military technology transfers have been occurring since the propeller era. They are a defining feature of the company. In 1933, for example, Boeing introduced the Model 247, which historians call the world's first modern airliner. Two years later, Boeing rolled out the Model 299, a four-engine military prototype that looked like a scaled-up 247 and borrowed heavily from it. The 299 evolved into the famous B-17 Flying Fortress bomber of World War II. In 1940, Pan American Airways and TWA caused a sensation when they placed Boeing Model 307 Stratoliners into service. This 33-passenger propeller airliner was the first production airplane ever to have a pressurized cabin. Whereas the unpressurized DC-3 and other transports of the day had to slog through the weather, the Stratoliner cruised serenely above it at 20,000 feet. World War II called a premature halt to Stratoliner production, preempting what might have been a great commercial success for Boeing. But this design's innovations lived on. Cabin pressurization—a commercial technology—was promptly drafted for the war effort aboard the Boeing B-29 Superfortress, a high-altitude bomber. Technology flows both ways, of course, and military requirements largely drove the development of flight in earlier times. One military-to-commercial technology transfer of a half-century ago would forever shape opinions that military programs lead the way. In 1947, the radical Boeing B-47 Stratojet took flight over Seattle and ushered in a quantum leap in large-aircraft performance. That U.S. Air Force bomber featured jet propulsion and swept wings, two technologies pioneered by Germany in World War II. Its success set the stage for Boeing's entry into commercial jet aviation. To demonstrate its ideas for what a jetliner should be, Boeing constructed the Model 367-80, a company-financed prototype that flew in 1954. The Dash 80 in turn gave rise to the Boeing 707 of 1958. The rest, as they say, is history. However, it is often incorrectly assumed that the USAF C-5 competition—which Boeing lost to Lockheed in 1965—gave rise to the 747. In fact, the 747 was an entirely different design that owed nothing to Boeing's work on that military proposal. The 747 was entirely privately financed, an expensive gamble that resulted in success.